Have you ever opened a bill only to find a whopping charge at the bottom? There are often many causes for this. Maybe you got charged the wrong price, or overcharged. Perhaps the provider or company you use simply charges more than you were hoping to pay. Whatever the case may be, there are times when you just can’t pay or have merely grown tired of trying to scrape by due to high-cost bills. That being said, however, just because you receive a bill, doesn’t necessarily mean you have to pay it in its entirety. 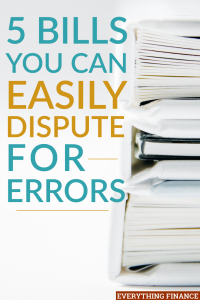 If you feel a company or organization has made an error or charged extraneously, don’t be afraid to say something and dispute said charge. While this might not work for every bill, the worst they can say is no, which is why it’s always worth it to give it a try. Here are five bills you can dispute if they contain errors. Medical bills seem to steeply rise on a daily basis. More often than not, you’ll receive an exorbitant bill for something as simple as a check-up. Not to mention an extended hospital stay, which could leave you with a six-figure charge. That being said, just because medical costs are on the rise, doesn’t necessarily mean you’re being charged correctly. In some cases, insurance doesn’t pay a hospital or doctor the amount they’d like to receive. So, in turn, the health-care organization or doctor charges the patient for the missing amount. In other instances, the hospital or provider has simply overcharged you. Whatever the reason, if you feel that your bill is outrageous, don’t feel pressure to pay the bill. Instead, gather the facts and prepare to dispute it. Be sure to keep all records of any bills and medical procedures organized and handy. Make sure they give you an itemized bill of everything they’re charging you for and extensively look it over. Ensure you haven’t been charged for any supplies that should be included in the overall bill, such as gowns or sheets. After reviewing your bill, either speak with your insurer if you know they should have paid more or make a point to speak with the office or hospital. Work to negotiate your bill, if all charges are correct, you could create a payment plan or offer to pay now at a discount. In the event that your bill is an error, you may want to consider hiring an attorney or health-care advocate to help you navigate the process. Most of us have had moments when we notice either a fraudulent charge, failures to post payments or returns, extra charges, or charges that list the wrong amount. It’s frustrating to open your statement only to find that you owe much more than you originally planned. Thankfully, credit card charges aren’t written in stone, which means you have every right to dispute them. First and foremost, you can call your credit card company and explain the error. From there, it may be a good idea to send the creditor a letter or email inquiring about the billing error, be sure to include your information and copies of any sales slips, receipts, or confirmations. It’s important that you do so as soon as you notice the error. The creditor then has 30 days to respond and has the duty of ensuring that the problem gets resolved within 90 days. Of course, it’s important to remember that regardless of your billing dispute, your still required to pay any correct charges during the billing cycle. Like your credit card bill, utility bills are known to have errors every now and then. If you receive your monthly bill to find that you’ve been given a water or electric bill that’s more suitable to a large family instead of a single person, you may want to dispute said utility bill. Before you contact the company, gather any present and past bills you have on hand. By presenting them with past bills, you’ll make the case for why the current one can’t possibly be yours. Be sure to take notes during your conversation and write down any important information. If a call doesn’t resolve the problem, you may want to follow up with a letter as well. In most cases, the utility company will realize it’s mistake and correct the bill. If that’s not the case, however, you may want to turn to your state’s public utilities commission for assistance. While you won’t be able to completely dispute cable and internet bills, unless you have wrongful charges, there are still ways to negotiate down. Cable and internet companies have a tendency to be extremely competitive. If you feel as though your provider is charging you too much, playing around with the option of switching to a competitor is a surefire way to get their attention. Gather up alternative rates from various competitors and then, put in a phone call to your provider. See if they’re open to lowering or discounting your rates to match that of a cheaper competitor at the rate of keeping you as a client. Chances are most providers will be willing to work with you; that being said, be sure you clarify any expiration dates that go along with said offer so that you aren’t surprised when you receive your bill in a couple of months. Just like cable and internet, car insurance tends to be competitive as well. Everyone wants your business and no one wants to lose you. Just as you did with your cable provider, don’t be afraid to gather other companies’ rates, to try and negotiate your way to a lower price. It’s also a good idea to simply call your insurance company and inquiry as to what your options are for potentially saving money. You can get your business voice heard by by visiting this page and jump online to learn internet marketing. It’s important to always review and be cautious of any bills you receive. Errors and overcharges happen, especially in a primarily digital culture. Thankfully, if you take control of your accounts and catch those problems and extraneous charges, you usually have the option of disputing them. Have you ever disputed a bill? If so, how did you go about it? Did it get corrected quickly or was it a long process? How much should you pay for Eyeglasses?